Cultivating Concepts: Independent Reading and an Honor! Last week my kiddos were doing such a great job during independent reading time I decided to take a moment and shoot a quick video of them. It has taken us about 30 plus days to get to this point, but I think we are finally getting the hang of it. Right now our independent time only last about 10 to 15 minutes each morning, but we are building stamina every day! I am so delighted and grateful for the nomination of the two awards from my bloggy friend Barbara at The Corner on Character. 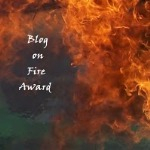 She has nominated me for the Blog on Fire award and The Versatile Blogger Award. I have seen this award on various other blogs and have thought “how cool is that!” But now I too have the honor of posting the award on my blog. I am so ECSTATIC. I often don’t find the time to blog as much as I would like but maybe this will give more incentive. I am supposed to post seven things about myself and then pass the award on to my top ten blogs which is going to be tough because the one that nominated me is already nominated, and so are many of the other blogs I love, but I will do my best. Congratulations on your honors. It's always nice to hear compliments. I've enjoyed your blog, although my passion is older students. You are so enthusiastic and full of great ideas for your students. Thank you SO much for recognizing my blog. I am so flattered and extremely grateful. Now I need to make some time to say thank you and pass on the love. 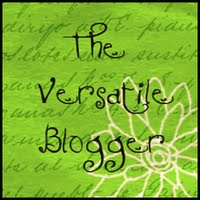 I have enjoyed reading both of your blogs and would love to meet my blogger friends in person as well. Congrats on your awards and thank you for mine. Tammy, I'm sorry, I didn't see my name on your list, and didn't find out you had nominated me until I read the comments on my last post. Thank you for your compliment. I am honored that we are making a relationship. I want to tell you that I was nominated last week by another blog, so I won't be responding to yours, at least by the specific directions. We write in a small world, right? Thanks again! Congrats and thank you for the mention ^_^ I love to sew too! I was so happy when I got my Janome machine a couple of years ago for my bday. Have a fantastic week. Thank you so much for the honor! It made my morning when I got your comment! What a great start to a Monday :) Have a great week!